A metagenomic fosmid library containing 1 × 105 clones was constructed from a biogas digester fed with pig ordure and rice straw. In total, 121 clones with activity of 4-methylumbelliferyl-cellobiosidase were screened from the metagenomic library. A novel GH5 cellulase gene exo2b was identified from a sequenced clone EXO02C10 and expressed in Escherichia coli BL21. The corresponding recombinant Exo2b protein showed high specific activity toward both carboxymethylcellulose (CMC; 260 U/mg protein) and β-d-glucan from barley (849 U/mg), with an optimal pH and temperature of 7.5 and 58 °C, respectively. Exo2b showed stable activity at a wide pH range from 5.5 to 9.0 and was highly thermostable at 60 °C in the presence of 60 mM cysteine. Residual activity was maintained at nearly 100% when Exo2b was incubated at 60 °C for 15 h. A thin-layer chromatography analysis of the hydrolysis products confirmed that Exo2b was an endo-β-1,4-glucanase and it could also produce oligosaccharide smaller than cellotetraose. The fragment encoding the Exo2b catalytic domain was then fused with the cbh1 gene from Trichoderma reesei, and the fused gene was successfully expressed in T. reesei Rut-C30. Compared to that of the parent strain, the filter paper activity and CMCase activity of the secreted proteins of a selected transformant A1 increased by 24% and 18%, respectively. Besides, the glucose concentration from the hydrolysis of pretreated corn stover by the A1 secreted proteins increased by 19.8%. 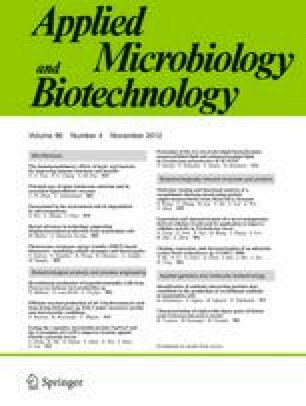 The present study demonstrated the potential application of metagenome originated cellulase genes to modify cellulase producing fungi. Alei Geng, Gen Zou, and Xing Yan contributed equally to this work. The online version of this article (doi: 10.1007/s00253-012-3873-y) contains supplementary material, which is available to authorized users. This work was financially supported by National Basic Research Program of China (973 Program) (2011CB707403) and the Knowledge Innovation Program (nos. KSCX1-YW-11B3 and KSCX2-EW-J-12) and International Joint Research Program (GJHZ1128) from the Chinese Academy of Sciences.